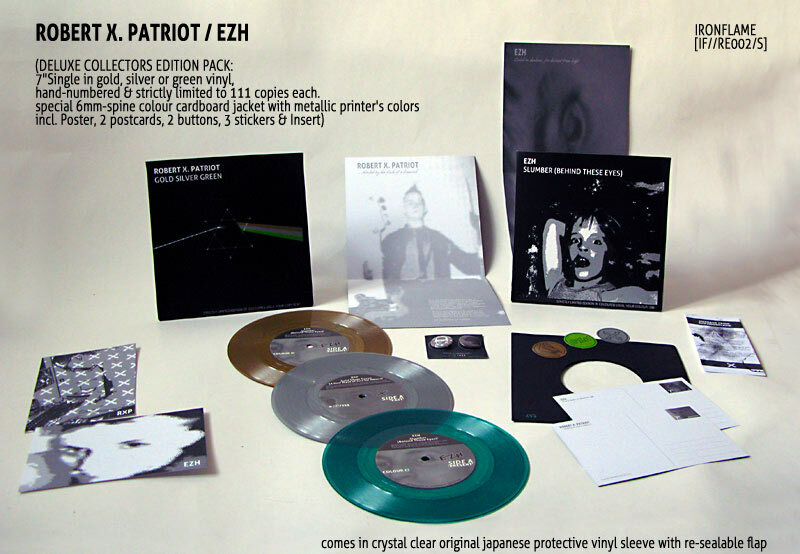 [ironflame] ROBERT X. PATRIOT / EZH - Split-7" OUT NOW! => LISTEN! 7"Single in gold, silver or green vinyl, hand-numbered & strictly limited to 111 copies each. [A] ROBERT X. PATRIOT: a collaborator of The Electric Hellfire Club, Boyd Rice and Warcom, ROBERT X. PATRIOT made quite a name for himself in the mid nineties by appearing on such cult samplers as 'How Terrorists Kill', 'Men and Mice' and 'Psychick Wolves ov Midgard'. Not to mention his own infamous and much sought-after 'Dogs Leg Rising' album, a rather tongue-in-cheek „tribute“ to the World-Serpent-Family, as such titles as 'Freya Aswynn's Basement', 'Hitler in Khakis', 'Ou est Klaus Nomi', or 'Vichy Toast Sunrise' clearly suggest. But the best kept secret about ROBERT X. PATRIOT probably is his long-burning passion for the synth pop of the early 80s: think Ultravox, Duran Duran and all the heroes of the Electronic New Wave movement. A genre he will be associated with forever after the release of this single… Then not only is 'Gold, Silver, Green' clearly destined to become an all-time hit, it is also and without exaggeration or self-indulgence a true HYMN which will soon find its place on every playlist of every party, every webradio and every podcast of the ever-growing Minimal-Synth- / Electronic-New-Wave scene! [A] EZH: known in the Hamburger underground of the late eighties as the editor of bad taste / nonPC / music fanzine “I.d.A.f.”, EZH has been active since the early nineties as a DJ for Electro, New Wave and Post-Industrial and made quite a stir in 2000 with his 9:30mins long technoid monster 'Slumber' (only available as a DJ-Promo at the time). Ironflame now releases a brand new single-edit of this track, remixed by none other than Berlin Italo-/Electro-/NewWave-eminence DJ Hanoben (cultheroes.com). T H I S I S N O S P A M ! TO UNSUBSCRIBE PLEASE SEND MAIL WITH SUBJECT "UNSUBSCRIBE"! The Tea Bazaar will specially open it's doors on Sunday the Twelfth, for a visit by a couple of the experimental music's finest, as they manipulate analog synths to pleasing effect. With special guests Myceum and Jackfruit Experiment. Greg Davis is a musician from Vermont who creates lush, textured soundscapes using a wide range of acoustic and analog instruments, as well as samples from field recordings. Chicagoan Ben Vida is perhaps better known for his work with the bands Town & Country, Joan of Arc, and has written and recorded for years under the name 'Bird Show'. Gorgeous ambient sound sculptures by Mr. Scott Ritchie. Members of The Grapefruit Experiment, Dzian!, Pinko Communoids, etc. offer up this variation on the theme (which is creating fascinating sounds in astounding ways). 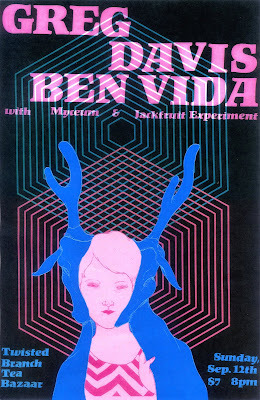 "For The Grapefruit Experiment, though, this was the desired effect, and it mingled well with the deliberately arrhythmic percussion and oscillating bursts of treated noise. It wasn't a conventionally musical set by any means, but nonetheless The Grapefruit Experiment gave a fascinating performance." The Friction Brothers (Michael Colligan, Fred Lonberg-Holm and Michael Zerang) are perhaps the only dry-ice/cello/percussion trio in the visible world. 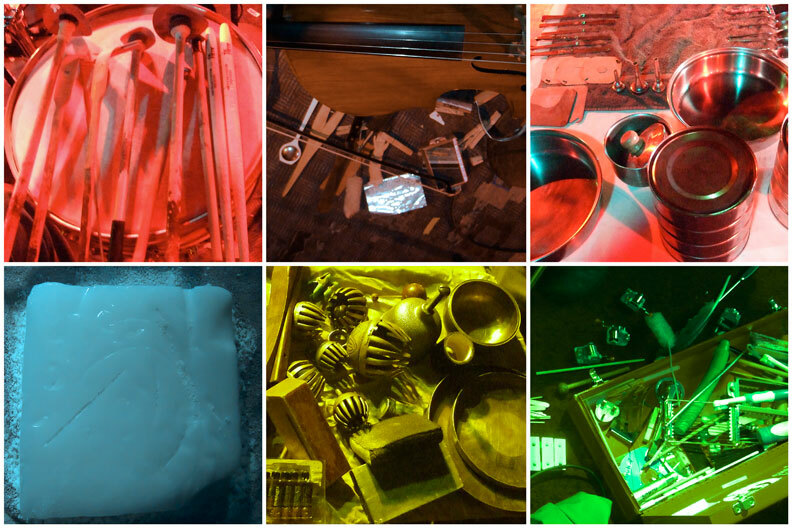 Begun in 2005 to perform improvised works that explore their love of scraping, rubbing, hitting and freezing various objects to the point of vibration, they have appeared at a number of questionable venues in Chicago. While often sounding like electronic music, they make all their sounds mechanically. To produce these sounds each member has developed an expansive vocabulary of extended techniques. Zerang has raised the back scratcher to an essential component of the modern drummers stick collection. Colligan, warms up metal objects and the super cools them on a block of dry ice making them vibrate in the audible range. Lonberg-Holm’s grind tone remains an unexplainable phenomena by acousticians. Although the trio is a relatively new group, the members have worked together extensively for over 15 years in a wide variety of settings from the seminal lower case 4tet Pillow to the internationally known free improvised jazz powerhouse Peter Broetzmann’s Chicago 10tet. Their first CD was released by the Sort Of Records imprint Abstract On Black. They are currently working on a second release due out on the Flying Aspidistra label in June to coincide with their first North American tour. as well as numeorous one off ad-hoc groups. Zeena Parkins, Judy Dunaway, Lotte Anker as well as a number of guys. Orlando Cole and Ardyth Alton. Baskin Robbins as a scooper. He has also played various homemade and traditional reed instruments. and currently resides in that city. kamama in cherokee means both elephant and butterfly. there is no overlap in meaning other than the supposed resemblance of the long trunk and flapping ears to the proboscis and wings of that insect. this duo loosely embodies elements of this kind of disparate pairing. chen and marini combine the raw energies resultant from and continuously growing out of their respective histories and experiences. since their first encounter early this year in 2010, they have been forming a new language which steadily deepens, evolves, converges and exposes their inherent similarities and striking differences. it is ecstatic music. it is contrary music. and at times, they depart completely from one another as two distinct creatures, but then are drawn back into the fold of an undeniable tenderness and comprehension. AUDREY CHEN is a Chinese-American musician who was born into a family of material scientists, doctors and engineers, outside of Chicago in 1976. Parting ways with the family convention, she turned to the cello at age 8 and voice at 11. After years of classical and conservatory training in both instruments, with a resulting specialization in early and new music, she parted ways again in 2003 to begin new negotiations with sound in order to discover a more individually honest aesthetic. Now, using the cello, voice and analog electronics, Chen’s work delves deeply into her own version of narrative and non-linear storytelling. A large component of her music is improvised and her approach to this is extremely personal and visceral. Her playing explores the combination and layering of a homemade analog synthesizer, preparations and traditional and extended techniques in both the voice and cello. She works to join these elements into a singular ecstatic personal language. Recently, her primary focus has been her SOLO project but she is also involved in many various collaborations. Among musicians, she has worked with Phil Minton, Tetuzi Akiyama, Toshimaru Nakamura, Ko Ishikawa, Elliott Sharp, Aki Onda, Phill Niblock, Frederic Blondy, Jerome Noetinger, C. Spencer Yeh, Alessandro Bosetti, Mats Gustafsson, Mazen Kerbaj, Michael Zerang, Tatsuya Nakatani, Le Quan Ninh, Joe Mcphee, Susan Alcorn, Michele Doneda, Paolo Angeli, Gianni Gebbia, plus many more. Some current projects include: duos with Phil Minton, Luca Marini (kamama), Frederic Blondy, Robert van Heumen (abattoir), Katt Hernandez (Isabel), Nate Wooley (heave and shudder), and Id M Theft Able. Trio with Nate Wooley and C. Spencer Yeh. Plus three new quartet projects with Jeff Carey/Morten J. Olsen/Raed Yassin, Miya Masaoka/Hans Grusel/Kenta Nagai and also with Frederic Blondy/Michael Johnsen/Jerome Noetinger. Chen has performed in Europe, Russia, Australia, New Zealand, China, Japan, Taiwan, Canada and the USA. She is currently based in Baltimore, MD USA but primarily maintains an active touring schedule throughout Europe. LUCA MARINI (1982) is a German/Italian drummer who mostly grew up in France and is now based in New York (USA). After studying jazz and improvised music at various conservatories and music colleges in Europe and North America he developed his own language and approach to percussion while living in Berlin (D). Current bands include the duo HERBERT ECKARDT with Danish saxophonist Louise D.E. Jensen, the duo BLIN with Dutch guitarist Jasper Stadhouders, KAMAMA with Chinese-American cellist and vocalist Audrey Chen, CAVEX from Brooklyn, The LITTLE from Germany and TATUNE from France. well as Post-Tonal orchestration and computer music with Ted Coffey. Florida for a Ph.D in Music Composition. Free Speech for Richmond's May Day! Richmond May Day Organizing Committee has sent you an invitation to sign the petition "Free Speech for Richmond's May Day!" on Change.org. Click the link below to view the petition.